Now up to six players can muster their knights against the scourge threatening Catan! The 5-6 Player Expansion for Catan: Cities & Knights� allows you to expand and inject more excitement into your games without sacrificing ease of play. Designed for five or six players, it adds even more drama to the award-winning game of culture, politics, and warfare. In the Catan: Cities & Knights 5-6 Player Expansion you control a group of settlers who must defent Catan from raiding barbarians. Field your knights, build a magnificent and impregnable metropolis, and enrich your cities with fine culture and flourishing trade routes. Culture and military might will make Catan yours! 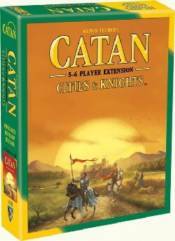 You must have The Settlers of Catan board game and the Cities & Knights expansion in order to use this extension. Requires ownership of MFG3061 The Settlers of Catan, MFG3062 The Setters of Catan 5-6 player Extension and MFG3065 Cities & Knights of Catan Expansion to play.